Can I stick it in my lab coat pocket without damaging the probe? 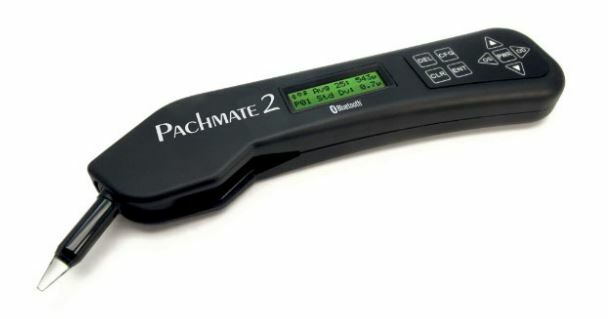 The DGH Pachmate 2 has a retractable probe that is completely protected in the retracted position. How many buttons do I have to push before I can take a reading? With the Pachmate 2, only one step is needed: turning the unit on. Can I get the readings into my computer without retyping? The DGH Pachmate 2 uses Bluetooth technology to transmit readings to any Windows computer. The system can even be set up to produce a printed report from your computer’s printer, completely automatically. What if I need to measure corneal thickness in multiple locations? The Pachmate 2’s Mapping Mode gives you that capability. Can I check whether the unit is still in calibration? The DGH Pachmate 2 comes with a calibration box that lets you check calibration whenever you want. You’ll always know the unit is still accurate. If I have a battery problem, can I easily get a replacement? The DGH Pachmate 2 uses off-the-shelf AAA batteries, either rechargeable or conventional. You’ll never need to special-order a replacement battery. Only the DGH Pachmate 2 offers this set of features.